We usually cone across areas where a user needs to control his domestic or company door lock from wide distances. Here we propose a system that allow user to unlock a door by entering a password remotely. We propose to use GSM technology ie through SMS. 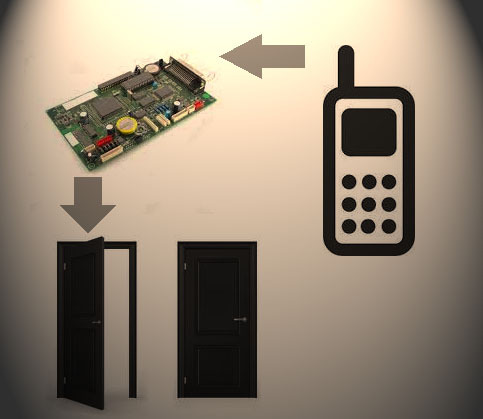 Our system allows user to send an sms with password in order to unlock a door. The door opens on receiving the right password. The system also alerts a registered user if wrong password is sent a number of times. The circuit consists of a gsm modem to receive sms data. It decodes the sms and sends it to an 8051 family microcontroller. The microcontroller reads the input and checks the password entered. It displays message stats on an LCD screen on receiving inputs. On receiving the right password it opens the door by activating the motor. On encountering wrong password multiple times the system sends an sms through the GSM modem to registered user that invalid attempts were made.